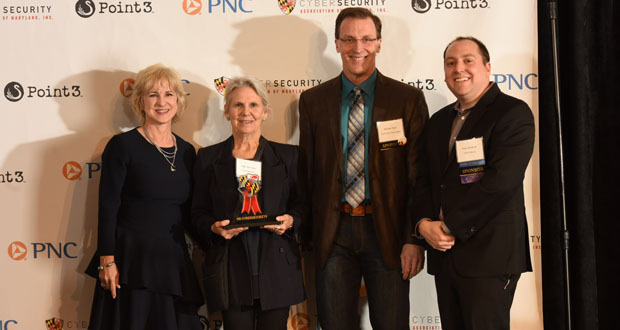 The Baltimore-based Cybersecurity Association of Maryland Inc., in partnership with PNC Bank and Point3 Security, honored 13 individuals and companies during the second annual Maryland Cybersecurity Awards event March 27 at the American Visionary Art Museum. More than 300 guests attended the sold-out event, which featured congratulatory video presentations from U.S. Rep. C.A. Dutch Ruppersberger, R-Md., and Gov. Larry Hogan, expressing their support of Maryland’s cybersecurity ecosystem. The event was co-emceed by Evan Dornbush, co-founder and CEO of Point3 Security, and Jay Turakhia, vice president in the corporate and institutional banking division in the greater Maryland market for PNC Bank.